“2048”, the simple and difficult game, is very interesting. Time flies, so I need to put a stop. 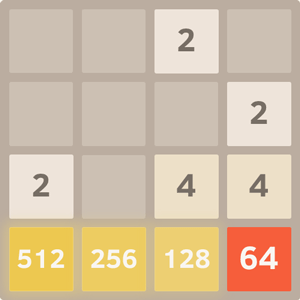 The boom of “2048” has calmed down, but many people play the game. 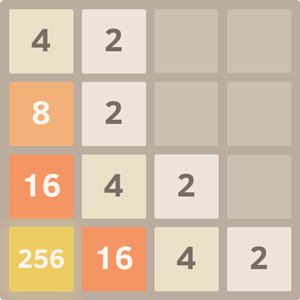 I will write the interest and the difficulty of the game “2048” and show you my strategy to clear. 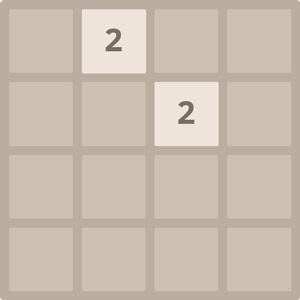 The source of the game “2048” is open on github. Many people made lots of the derivative games whose rules are different a little. I explain the main rule of many derivative games. If you know the rule of “2048”, you can skip this section. The goal of the game “2048” is to make “2048”. The board has 4 x 4 cells. At first, there are two figures on the board as above. And you move the figures. Direction is up, down, to right, and to left. You can choose one of them. After moving the figures, if one figure hits another and they are the same number, they’re merged to become one figure which is double. And a new figure appears on an empty cell. In this situation, if you move down figures, two 4 merge to be 8. You repeatedly move like this. 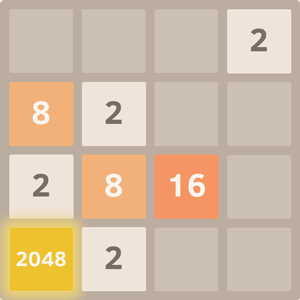 You will clear when you can make “2048” as below. The game will be over when all cells are full and you can’t move any figures. 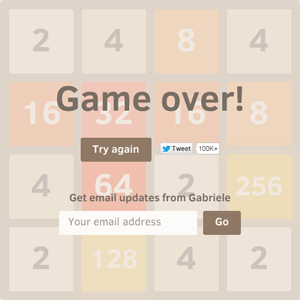 You can play the game “2048” on the browser, the smart phone application and Nintendo 3DS. The basic rule is like this. Many derivative games have original rules, so I can’t tell you all rules. By knowing the basic rule and playing the derivative game, you will understand the original rules. Why is the game “2048” interesting? The reason is that the game is simple but difficult, I think. You can make 128 or 256 easily, but it is difficult to make the larger number. You come near to the goal, but you can’t clear. So you are addicted to it. And you feel good when you merge figures. I think it is the good point of the game, too. Like Tetris, to disappear something make us feel good. This point is necessary to the games. The game is simple, looks easy to clear, and you can come close to the goal but you can’t clear easily. This is interesting about the game. 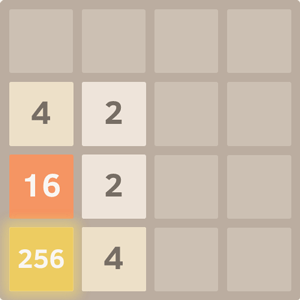 On the game “2048”, many people think they come close to the goal when they can make 256 or 512. But, not “close”. There is the great distance between 512 and 1024, and greater between 512 and 2048. To clear the game “2048”, what do you need? Just before the goal, you will have made “1024 + 1024”. Unless this, you can’t clear. And just before that, you will have made “1024 + 512 + 512” as below. Four “512” is also OK if you can merge two “512 + 512”, but more difficult. So even if you make only one “512”, you have to make many figures. The goal is not close. When you repeat like this, you must make “1024 + 512 + 256 + 128 + 64 + 32 + 16 + 8 + 4 + 2”. If you have two “64”, you don’t need from 32 to 2 but you need from 128 to 1024. And more, the figures must be close each other to merge easily. You must make each large figure which are close each other. And you have only 16 cells. The larger figure you try to make, the harder you clear the game. If you don’t know this, you will mistake how close the goal is. You will do the same mistake again and again. So, how do we clear the game “2048”? As I said before, the point is that you make from 1024 to 2 which are close each other to merge. The situation like below is ideal. At first you should make the largest number at the corner. I like the bottom left corner, so I explain on the assumption that I make it there. 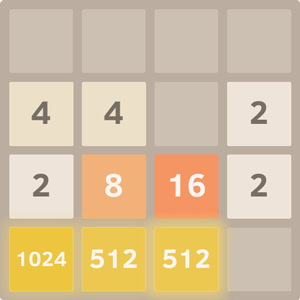 As I said before, you must make 1024 for 2048, and make 512 for 1024. If you go ahead with no strategy, the large numbers will be scattered and be hard to merge. So you should decide where you make the largest number. I said that you should make the largest number at the corner. But it has a problem. You move figures only to left and to bottom. This is very inconvenient, so you will fill figures in the bottom row. After that you will be able to move them to right. Of course, you may fill figures in the left column. You will use the three directs. You can move other figures with the largest number fixed at the corner. By merging from above or from right, you make the largest figure at the bottom left cell. At this point, you should make large figures in order in the bottom row. Let’s suppose that you make 512, 256, 128 and 64 in the bottom row. When you merge 64 and another 64, you can make 1024 easily. You make 64 in from 1st to 3rd line. You should make 64 at the right cell in the 3rd line like the bottom left corner. You may be able to make 64 with no strategy because it is small. It is OK, but you should make them in order in the bottom row because it is difficult to make the large number. If you make 512, 64, 256 and 128 in the bottom line, it is not easy to merge. When you make another 64, it is difficult to merge two 64. It is more difficult to merge two 128 after that. Other figures are the interruption to merge. You need to move many times, but many moves cause many new figures. You will have no way soon. So it is important to make large figures in order. 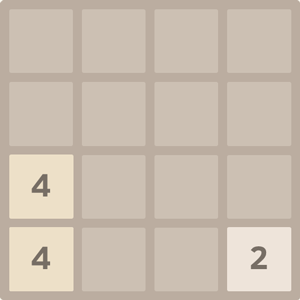 I wrote the interest, the difficulty, and the strategy of the game “2048”. The strategy doesn’t ensure to clear the game, but you will go “close” to the goal. It gives hints to those who don’t have any strategies and can’t make larger figures. 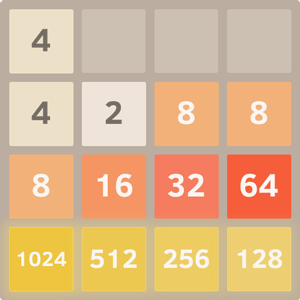 Enjoy the game “2048”, but don’t be immersed in the game “2048” too much.